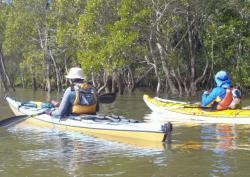 Today's paddle proffered a rare vestige of Moreton Bay, a place we had not yet explored by kayak. This and the promise of a 20Kn tail wind on the return leg made today's paddle worthwhile despite it's proximity to the Logan River. Not our favourite place. Nothing to do with the environment, but the unprovoked charm of rock chucking natives. 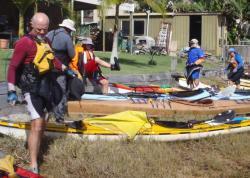 A staggered launch of six kayaks headed south from Weinam Creek on the flooding tide into a steady headwind. Monolithic homes crowded each other for their command of the Orchid Beach foreshore. Not that there was much sand. The murky waters disguise a rocky ambush and real estate prices would have to be subject to diurnal price fluctuations. 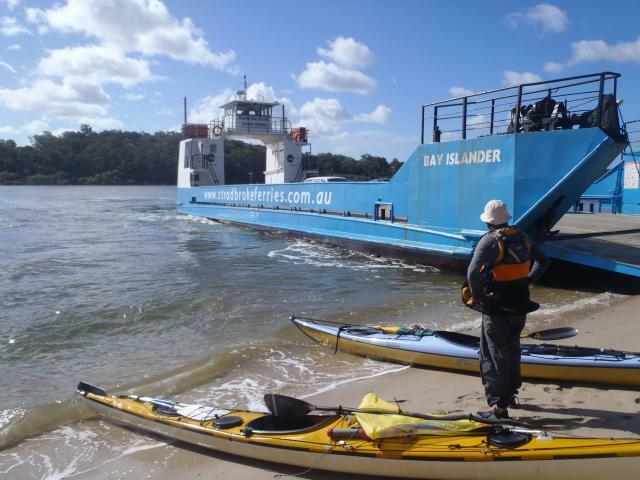 Once around Point Talburpin it was best guess for when turning right would take us into Redland Bay Channel and relative shelter from the insistent southerly. Large moored vessels provided reliable clues. Brian's location affirmation from fishermen in a powerboat took us around the eastern side of Redbill Island into the Logan River. By now there was an urgent need for a comfort stop. Slight technical hitch. The foreshore had become muddy and very public. There were tinnies a plenty and large trees amiss. After rolling out onto a very slippery muddy bank getting the giggles whilst clinging desperately to cooch for some form of purchase, it was off to look for some vegetative discretion. Tricky in a fluoro top and 3 foot high mangroves on a bank that was head high with what now seemed like an infestation of fishing tinnies. After slithering back into the cockpit it was a wash ride across the Logan for the protection of the mangroves to get some southern purchase for what looked like would be a bumpy ferry glide across to Rocky Point. A steady 15Kn on the beam and the temptation was too much. Much to Peter's horror up went the yellow and black and whoopee we were off. Oops. I had forgotten to untie the knots in the end of the sheets. This had the potential to end up in tears and the fingers couldn't work quickly enough. 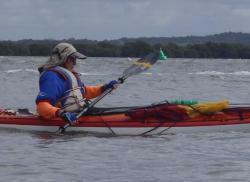 The other kayaks faded into the background while I aimed for where the pylons strode out of the water onto Rocky Point. It was a fun scoot until I let the sail go and waited. Phil came by then threw up his sail. Mark radioed permission to abandon post, so with no need for further encouragement it was back to the wind and pull on the sheet. Yee haa, it was time to hunt Phil down. When he turned to look at the squawking paddler coming alongside he reckoned I had a grin like a split watermelon. At the top of a choppy tide there is very little flat land around Rocky Point that looked like easily accessible public foreshore. A couple of feet less and the area under the pylon could have had potential. Turns out there is a bit of swampy foreshore (chairs advisable) about 100m further north of the six or so houses. Today a local kindly allowed us to pull up a pew on their front lawn. The bull ant wasn't quite so convivial and gave my touche a painful touch up. After a leisurely lunch in the welcome warmth of the sun it was back out into the bluster for a skid home. Brian was not looking forward to this. Mark gave me the OK to sail off with Phil while he came in at the rear and in contact via the UHF. 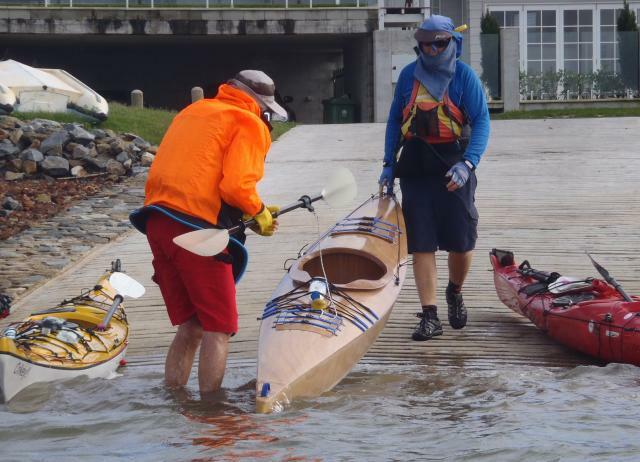 The start was fun but it soon dulled as the tide progressively took the same direction as the southerly. There were a couple of decent uncontrollable rides during which I worked out how to make Phil speed up. Quite simple really, just come careering down a wave out of control with a stern rudder not having much effect and ride up on the back of his kayak. 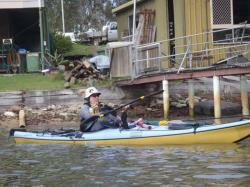 Nothing quite like a monstering by a cracked up old girl to make this brand new kevlar kayak go like the clappers. Of course all done whilst cackling like a goose. 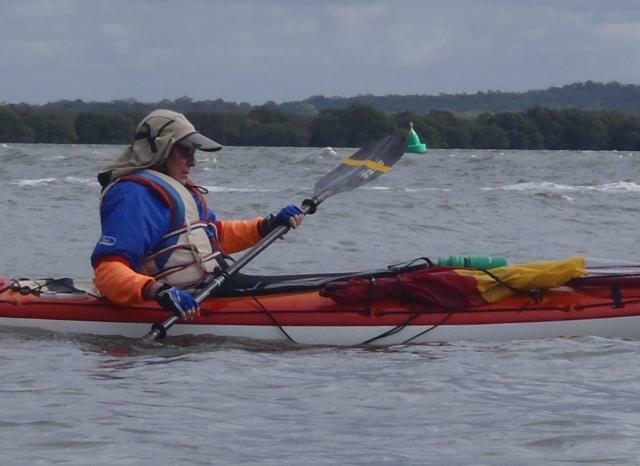 The two kayaks were pretty much an even match - Phil's superior sail area (downwind) was neutralised by my boats faster hull speed. However, I think the Werner paddle has it over my clapped out Canoe Sports model. There might be a bit of paddle technique in there, but jeepers don't tell Phil that. After a convenience stop at the best loo in Moreton Bay (Karragarra), Phil and I played touch tag with the other four and left soon after they came ashore. We needed to get across the southern end of Garden Island before the water ran out for the last sailing leg to Weinam Creek. Phil gave me the use of his other Werner paddle for this leg and yes, they are a good paddle. The tendonitis in my elbows settled immediately and it felt like I was paddling with nothing. 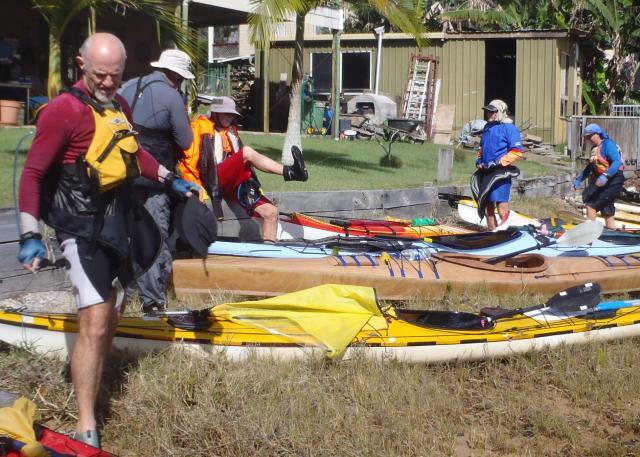 By the time Phil had packed the other four kayaks had just come through the Garden Island passage. Another 10 or so minutes and they would have enjoyed a muddy walk. 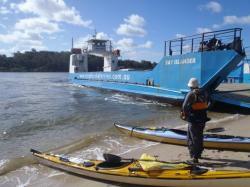 The wind we had so enjoyed remained steady, the tide was now whistling out so their plug back was one large ferry glide. I was pleased that we had done the hard yards first. 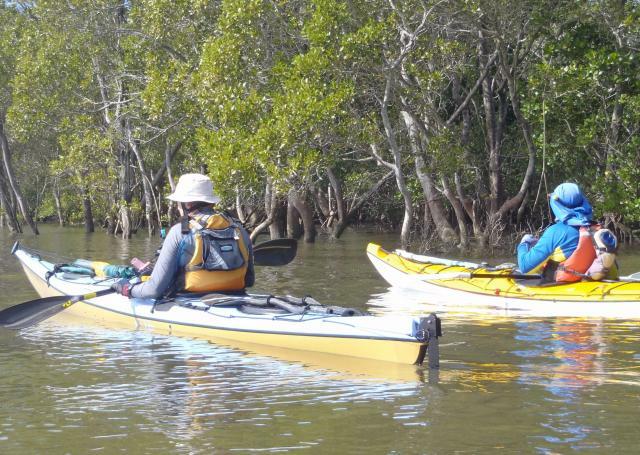 I was also delighted to have explored another part of Moreton Bay. Looks like I might have discovered the reason to fork out for a new paddle. Too bad I don't like the price tag - any crank shaft Kalliste 205 out there in need a new owner ?